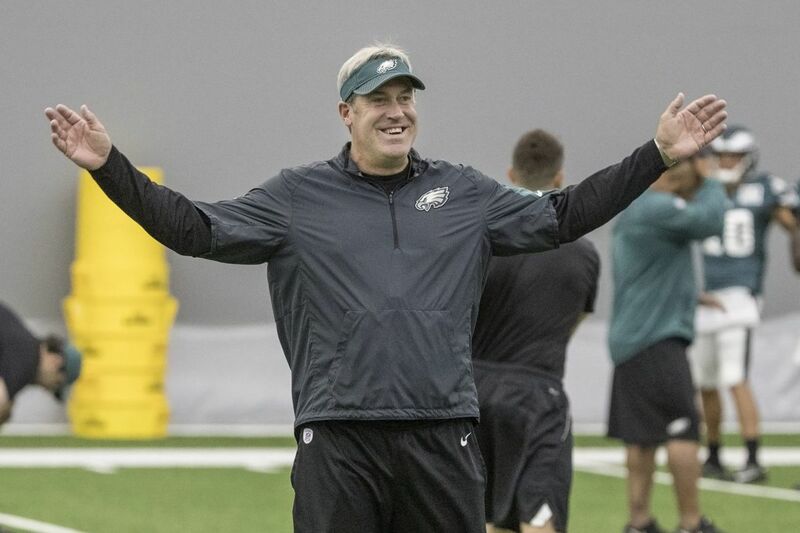 Eagle head coach Doug Pederson is all smiles before practice on Monday, under the big tent at the NovaCare practice facility. 1. Let's start at the end of practice: Caleb Sturgis was called upon by coach Doug Pederson to break down the team huddle. Why? The kicker had a good day with his right foot. Sturgis was 9 for 9 during a set of field goals that opened practice. He hit from distances of 32, 32, 39, 39, 41, 43, 45, 47, and 49 yards. A spell later, Sturgis was good from 54 (the ball hit the crossbar and plopped over) and 44 yards. The confines were friendly, but it was a strong showing after a shaky outing outdoors last week. Sturgis had a very productive 2016, hitting on 35 of 41 field goals and 30 of 31 extra points. The Eagles need him to be as accurate this season. 2. Wide receiver Alshon Jeffery was at practice for the second straight day, but he did only individual drills and watched any activity that had contact or could have potentially had contact. Marcus Johnson, who had been taking many of Jeffery's snaps with the first team, was sidelined for the first time with a hamstring injury. With Jeffery and Johnson out, Nelson Agholor lined up predominantly in the former's starting spot. Torrey Smith was opposite Agholor on the outside, and Jordan Matthews was in the slot. Quarterback Carson Wentz went to Matthews early on a slant, but the ball caromed off his hands and to the ground. There's been "talk" about Agholor playing more in the slot since he filled in ably for Matthews in the spring. It has only increased with Agholor's strong camp performance. Offensive coordinator Frank Reich conceded on Monday that there was competition at the slot position and that Agholor has played well inside. 3. Fletcher Cox took a veteran day off, according to the Eagles. I thought that only over-30 players were given that choice. Guess not. I'll have to check with Pederson. With Cox resting, Destiny Vaeao took his spot opposite Tim Jernigan. Defensive tackle is a position at which the Eagles are light, especially with Beau Allen still recovering from a torn pectoral tendon. Of the active players, only Cox and Jernigan are sure to make the final roster. Vaeao is next on the depth chart, but he's not a lock. Justin Hamilton and Gabe Wright have flashed at times. Rookie Elijah Qualls only recently returned from a groin injury. Winston Craig, an undrafted rookie, is also in contention. 4. Patrick Robinson has been steadier over the last week, and on Monday, he might have had the play of the day when he intercepted a Wentz toss. The quarterback went to his left on a quick out, but Robinson perfectly timed his break and jumped Smith's route. He probably would have gone the other way for a pick-six. Wentz hustled back to track him down, but the play was whistled dead. Agholor continued to come up with catches he might not have made a year ago. He plucked a Wentz bullet out of the air down the middle. Later, Agholor came down with a contested pass that both he and safety Rodney McLeod had deflected. 5. I haven't written much about Brandon Graham, but he was active Monday. The defensive end met running back LeGarrette Blount in the backfield for a would-be tackle for loss. And he was later credited with a "sack." 6. Cornerback C.J. Smith might have had his best showing this camp. He was physical against receiver Mack Hollins on several passes that went his way. Hollins has about 4-5 inches on him, but Smith was able to get up and knock two balls away with authority. 7. Shelton Gibson has had a tough time since the spring, but he shouldn't be completely written off. He had a solid practice. Cornerback Mitchell White batted away an early contested toss to Gibson, but the rookie receiver shined during four-on-three drills, once catching a ball with the help of his fingertips and another time outmuscling a defender on a 50-50 ball. Cornerback Jalen Mills broke up a Wentz attempt to Gibson on a slant. The first-team offense had some struggles in the red zone, but Matthews beat slot corner Ron Brooks for a touchdown to end the set. 8. Chance Warmack took over at right guard after Brandon Brooks left with an injury. The Eagles didn't have further detail as of this writing. Wentz and his unit continued to struggle during "backed up" team drills. Linebacker Mychal Kendricks read a short pass to tight end Zach Ertz. Defensive end Vinny Curry interrupted a Wentz handoff after Agholor faked a jet sweep. Mills disrupted a Wentz pass to Agholor. Curry got to Blount in the backfield. And McLeod blitzed off the left and "sacked" the unsuspecting Wentz. 9. Hamilton used a powerful get-off to push Warmack back a few yards during line one-on-ones. Warmack anchored well against Hamilton's second push, though. Curry destroyed tackle Matt Tobin during their faceoff. It was the fastest I've seen the end get off this camp. Curry brought the hammer Monday. Derek Barnett lined up on the left for the second straight day. The Eagles want their ends to be versatile, but could he rush predominantly from that side moving forward? Barnett had trouble powering up against tackle Halapoulivaati Vaitai, who easily pushed the rookie to the ground. Before Alex McCalister was to rush, defensive line coach Chris Wilson said, "Alex, have a plan." It might seem like a simple suggestion, but there have been moments when the second-year end hasn't look prepared. Qualls used a swim move to slip guard Aaron Neary. 10. And some leftovers: Running back Wendell Smallwood (hamstring) joined Cox and Johnson on the sideline. Quarterback Nick Foles (elbow), receiver Paul Turner (shoulder), guard Josh Andrews (hand), tight end Anthony Denham (calf), and tight end Adam Zaruba (concussion) were still out. … Linebacker Don Cherry intercepted Matt McGloin when he sat in the hole and read the quarterback's eyes. … The Eagles have a light 10-10-10 practice scheduled for Tuesday, followed by a walk-through Wednesday and then Thursday's preseason opener at Green Bay.